Using Google? Read this first! Below is a selection of online resources that include a vast number of articles on topics in Library & Information Science. Developed by librarians from a merger of high-quality databases from EBSCO and H.W. Wilson, and including many unique sources that were never previously available, this database provides full-text coverage and high-quality indexing to help librarians and researchers to keep pace with the latest trends in a rapidly evolving field of library and information science. Library Literature and Information Full Text Retrospective provides access to nearly 80 years of citations that document all of the innovations, controversies and people instrumental in the making of modern librarianship. Google works with libraries to determine which journals and papers they've subscribed to electronically, and then links to articles from those sources when they're available. Once you configure the Library Links settings in Google Scholar, links to the full text of articles will display in your Google Scholar results when they are available through Simmons Library. 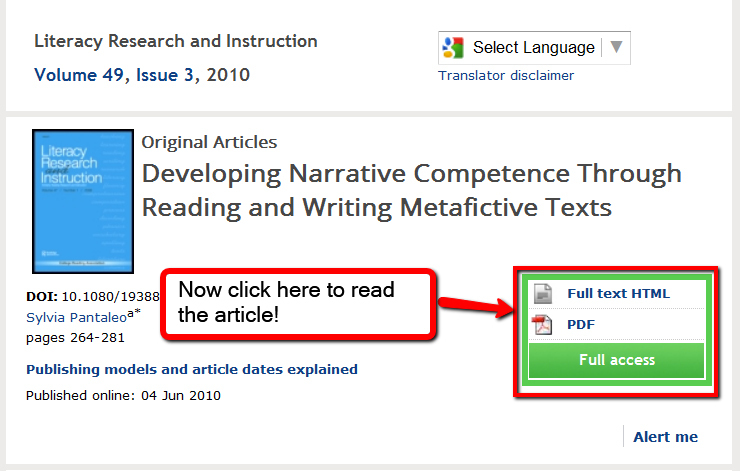 To make these links appear, just access Google Scholar from any Simmons computer and the links will automatically be included. 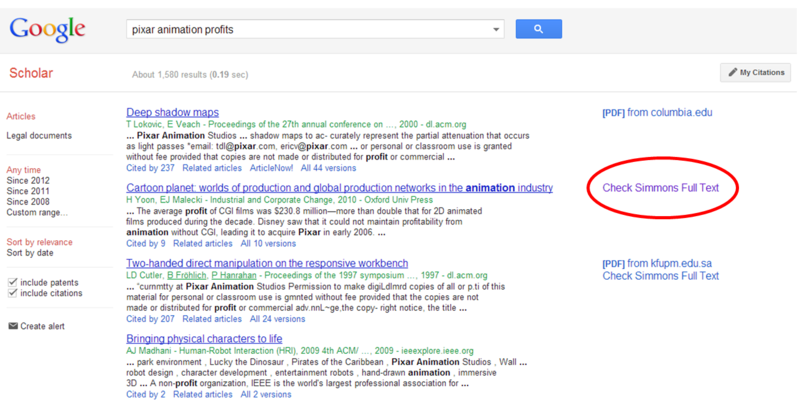 Click on Settings link in the upper right corner of Google Scholar. Choose "Library Links" on the left, type Simmons University and click the "Search" button. If prompted, check "Simmons University - Check Simmons Full Text" from the list of results. Start searching Google Scholar with links to our library's resources (you may need to log in to access these resources). Resources like Google Scholar will show you cited and citing references for any article you find in them. A good way to start a search. The important concepts in your own words. Found anywhere in the article (title, author, subject terms, etc.). Join similar ideas or alternate term with "OR." Link different parts of your topic with "AND." This is part of the publication & editorial process for academic and research journals. Being peer-reviewed is a sign that a paper's author(s) have done a certain level of due diligence in their work and their research is complete, manages conflicts-of-interest, and is fair and objective. When looking for Current Research, limit your date range to the last 3-5 years. Still not finding anything? Ask a Librarian! 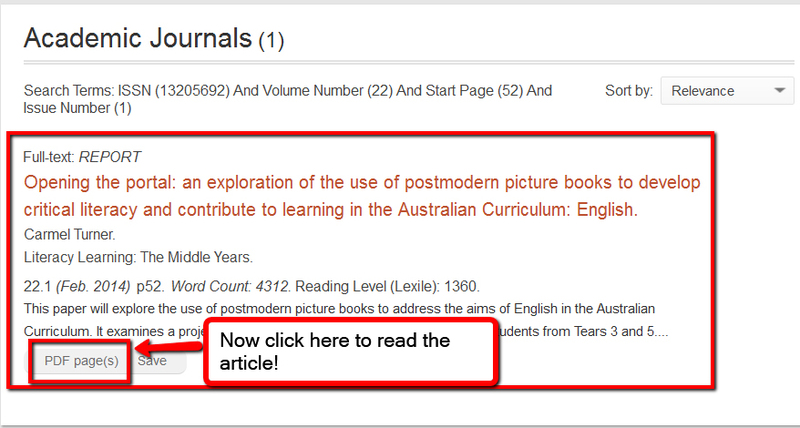 You can find the full text of an article in a number of ways, including direct links to HTML Full Text and PDF Full Text in the database you're searching as well as linked full text in a different database (Click here for Full Text) or an online journal (View Full Text). See the illustrations below for where to find the full text in each case.